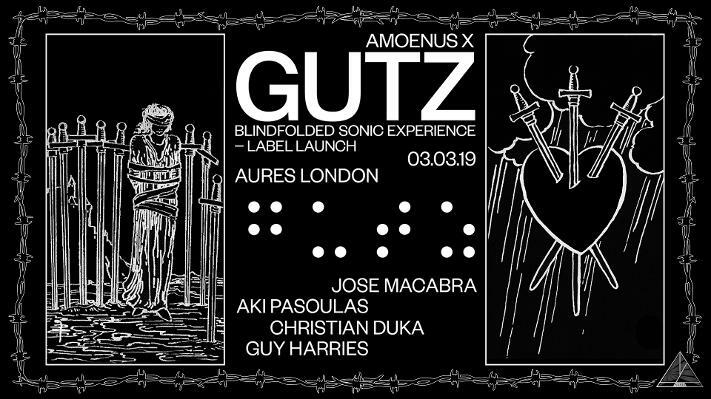 Sound artists Jose Macabra, Aki Pasoulas, Christian Duka and Guy Harries perform at the launch of the new sound art label "GUTZ". The project focuses on providing cinematic journeys for the ears, focusing on the potential of sound to create visceral emotional experiences. The event will see the artists spatialise their pieces live in front of a blindfolded, sitting audience of 50 people in three different sessions across the day. This partial sensory deprivation aims to pause the narratives of modern life, taking the participants through a meditative journey in the recesses of the unconscious. ​This performance invites the four artists to investigate pain in the everyday human experience. Going beyond the limitations of linguistic expression, the sound pieces aim to give various insights into the role of pain in emotional regulation, personal growth and transformation. In the context of the shared sonic experience, GUTZ also explores pain in the context of social bonding. £2 of each album sale will go to the LGBT+ anti-violence charity Galop who are doing very important work. Considering the violence and persecution that Turing faced, this seemed like the right choice. My sound and illustration collective Live Hazard has released its first album, based on live recordings from the collective's concerts and featuring Emily Shapiro, Illi Adato, Dave Fowler, Oli Haylett and myself, with cover illustration by collective co-founder Valerie Pezeron. Out now on Sombre Soniks.